He would be known as Jack P. Pierce a Stuntman and an Actor that dabbled in Motion Picture Make-up for extra cash. The last would become a career he never envisioned. Most of the posts on the internet about Jack Pierce only mention his major creations for the Classic Universal Horror Film series. Those specific make-ups being for "Frankenstein", "The Mummy" and "The Wolfman" with an occasional mention of his other Make-up work. Jack P. Pierce's career spans thirty-seven years covering both motion pictures and television. There are some "Classic" 1950's Science Fiction films also in his resume that I will be covering that are overshadowed by his Universal Pictures early work. This article is a film and photographic look at that career that seemed forever dominated by one Make-up design, because Jack P. Pierce would always remain "the Man Who Created Frankenstein's Monster". Pierce was born on May 5, 1889 in Valdetsyou, Greece as Janus Piccoula. I was interested in some information about the city of Pierce's birth for this article and entered "Valdestyou, Greece" on the Search Bar. Instead of information on a Greek City I was taken to articles about "Jack Pierce the Make-up Artist". Interesting. Jannus arrived in this country as a teenager and against his family's wishes changed his name to become more acceptable to those around him as many immigrants did to hide their roots.I could not locate anything about his education and do not have the actual date of his arrival other than it is mentioned as at the turn of the Century. Which would mean he was around 13, or 14 if we are thinking of 1902, or 1903. ---he attempted to play baseball, unsuccessfully trying out for a semi-professional team in California after achieving some notoriety as a shortstop in Chicago. He next worked in the fledgling motion picture industry in the 1910s and 1920s, trying his hand at a variety of jobs from nickelodeon manager to stuntman to assistant cameraman. On August 31, 1915 Universal Film Manufacturing Company aka Universal Gold Seal released a short film titled: "Misjudged". Playing "Baldy Joe-a thief" was Jack Pierce. I could not locate a description of this motion picture, but the names of the entire cast and crew are available. Pierce as either "Jack Pierce", or "John Pierce" would appear in 12 motion pictures between 1915 and 1929. The last two years would overlap the start of his make-up career. On February 20, 1927 Fox released a 60 minute movie titled "The Monkey Talks". This film was the first make-up work by Jack Pierce although as was typical of the period he received no screen credit. The film is also notable as being one of the many silents directed by Raul Walsh. The following link is to the only known copy of this motion picture. It is of very poor quality. At the time of this motion picture's release Pierce was still acting and on September 1, 1927 he appeared in a 10 Chapter Mascot Pictures Serial using the screen name "John" Pierce. The serial was considered lost, but in Europe Chapters 4,5 and 6 along with one reel of Chapter 7 were discovered and restored. Here is a link to Chapter 4 "The Volcano's Pit"
You can pick out Jack Pierce in some of the scenes. The reconstructed title has his correct name and not the "John Pierce" he used. Of interest is that the "killer ape" is called "Kong" and apparently he is referred to as the God King of the Island. Neither Merian C. Cooper, or Willis O'Brien were associated with this serial, but I live the name for my readers speculation about their motion picture released six years later. I could not locate the name of the make-up artist on the production. So speculation about Pierce doing that also might be warranted to save costs. One of the other films Jack Pierce appeared in was Charles Chaplain's 1928 classic silent "The Circus". Pierce was uncredited as "the man operating the ropes". The last motion picture Jack P. Pierce acted in was "Masquerade" released July 14, 1929. In that film he played "The Second Reporter" out of Four. On November 12, 1927 the film "She's A Sheik" opened starring three powerhouse actors who would easily make the transition to "Talkies", Bebe Daniels whose last film would be her 230th in 1955, Richard Arlen whose last film would be his 178th in 1977 and William Powell ("The Thin Man" and "The Great Ziegfeld") whose final film, his 95th, "Mister Roberts" would also be in 1955. This forgotten comedy was the second motion picture to have the Make-up work of Jack P. Pierce, but it is the next film that I want to direct my reader too as this was the start of those "Special and Chilling" designs that Pierce would become famous for. The film was "The Man Who Laughs" and was based upon the novel by Victor Hugo. Carl Laemmle the head of Universal Studios wanted Lon Chaney to play the role of Gwynplaine, but he was now under a long term contract with Metro-Goldwyn-Mayer Studios. Had Chaney been available the problem of Make-up design would have been handled by Lon Chaney himself. Chaney's final picture for Laemmle was three years prior the 1925 classic "The Phantom of the Opera". So at this point Carl Laemmle turned to the unknown Jack P. Pierce, based upon photos from "The Monkey Talks", to create some type of make-up for actor Conrad Veidt who was now playing the critical lead of Gwynplaine. Laemmle would be surprised with the result and Pierce after his final acting stint in 1929's "Masquerade" would become a full time employee of Universal Studios and shortly afterward find himself the Head of the Make-up Department.They say timing is everything and so it was for the now 39 year old. Here is a picture of German actor Conrad Veidt at the time. 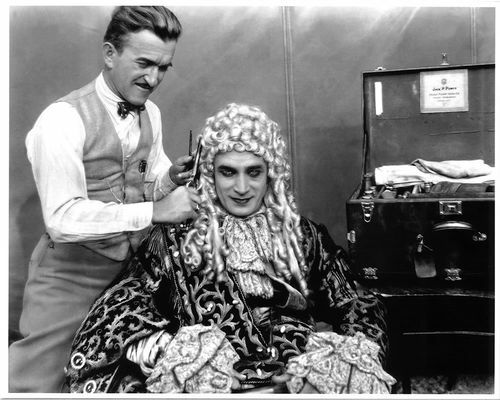 Here is Veidt in Jack Pierce's make-up for "The Man Who Laughs". Two make-up assignments followed 'The Man Who Laughs" "Broadway" and "King of Jazz" in 1929 and 1930 respectively. Then there was an interesting film make-up, if only for the actor it was placed upon in "East is West" released October 23, 1930. The following description from IMDb of the motion picture will sound funny to my readers today, but at this time such films were common. Playing Charlie Yong in Chinese make-up in his eighth feature film and two before "Little Caesar" was Edward G. Robinson. It is a little hard to see, but look at this lobby card. Released on February 14, 1931 "Dracula" had some interesting make-up work. One example was the great character actor Dwight Frye as he deteriorates into madness as Renfield. Both the actor's performance and Jack Pierce's make-up combine for a chilling portrayal. Another excellent make-up was used on actor Edward Van Sloan as Dr.Van Helsing. 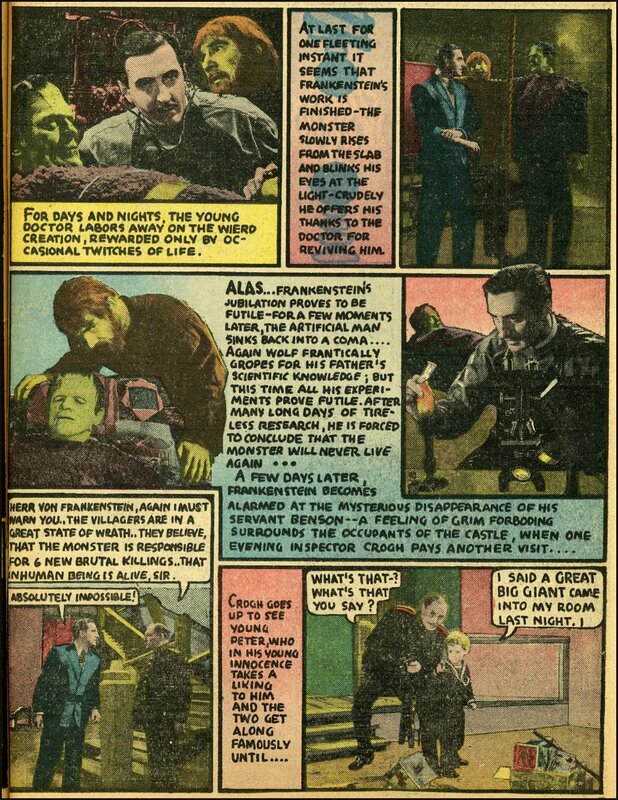 Jack Pierce had designed a special color make-up to make Dracula appear even more corpse like, but Bela Lugosi insisted and got the authorization to do his own for the film. 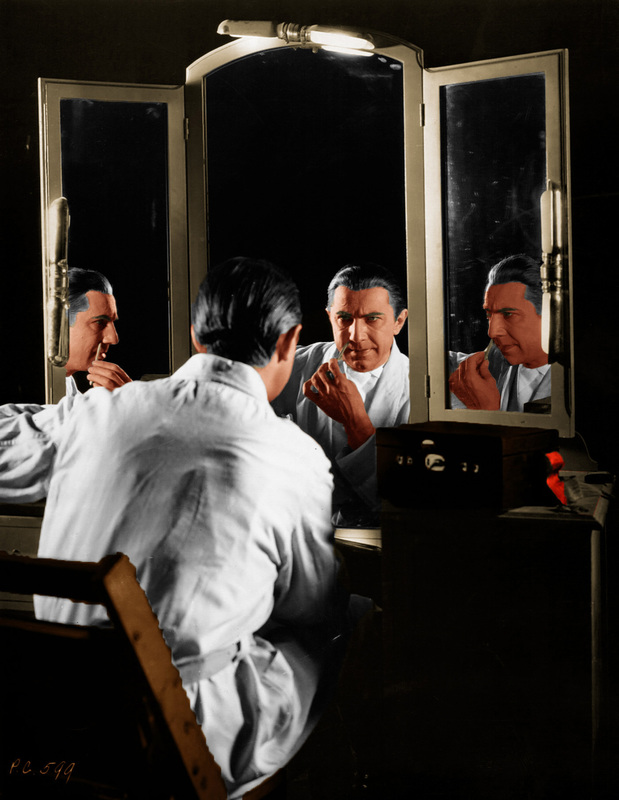 Here are color shots of Lugosi at his make-up table. The make-up Pierce had designed for Dracula from what I could learn was closer to Bram Stoker's vision than Lugosi's which harped back to his stage role as the Count. It is a shame that Lugosi wouldn't have at least tried the make-up so we could see what Jack Pierce had in mind, before he insisted on doing it himself. There are six ways a surgeon can cut the skull, and I figured Dr. Frankenstein, who was not a practicing surgeon, would take the easiest. That is, he would cut the top of the skull off straight across like a pot lid, hinge it, pop the brain in and clamp it tight. That's the reason I decided to make the monster's head square and flat like a box and dig that big scar across his forehead and have two metal clamps hold it together. The two metal studs that stick out the sides of the neck are inlets for electricity - plugs. Don't forget, the monster is an electrical gadget and lightning is his life force. Above the words of Make-up ARTIST Jack P. Pierce. The actor Pierce worked his magic upon was William Henry Pratt who had already appeared in 69 motion pictures before being "Discovered" as Boris Karloff in the 1931 film "Frankenstein". There is some controversy over the design of the "MAN" Henry, not Victor, Frankenstein made in the film. Some people over the years have argued that director James Whale made sketches which were used and other that there was input by the Head of Production for Universal Studios Carl Laemmale, Jr. Who received that position from his father as a 21st birthday present. One contribution to Pierce's creation is well documented though. Boris Karloff removed a dental plate that caved in one side of his face. Here are a few photos of Make-up Artist Jack P. Pierce at work on "KARLOFF" as he would be known in many films. Even if in this ground breaking film William Henry Pratt had no screen acknowledgement as the screen credits read: "Monster ?". Make-up on a comedy based upon a Preston Sturges stage play for relief from the hectic work of "Frankenstein" and than a little Edgar Allen Poe with 1932's the "Murders in the Rue Morgue" released in February. This film is by itself interesting. Even in a Pre-Code era the original running time of 80 minutes was cut to 61, because Carl Laemmal, Jr's. coucerns over the violence level. Unfortunately this footage is lost to the ages. The film was made as a peace offering to both Bela Lugosi who was to have played Henry Frankenstein and director Robert Florey who was to have directed "Frankenstein" and was replaced, for no known reason, by James Whale. This film was followed by a drama directed by James Whale and a comedy both released in March 1932. Then for an August 4, 1932 release Jack P. Pierce returned to Bela Lugosi as the creator of "The White Zombie". The story tells of a women being slowly transformed into a Zombie by en evil voodoo master played by Lugosi. The film is considered the first full length Zombie motion picture. I think Pierce's make-up for Lugosi make him look both truly evil and at the same time distinguished. Here is a link to the entire motion picture. It is truly still creepy and again Jack P. Pierce's make-up work is outstanding. How about a visit to an "Old Dark House". 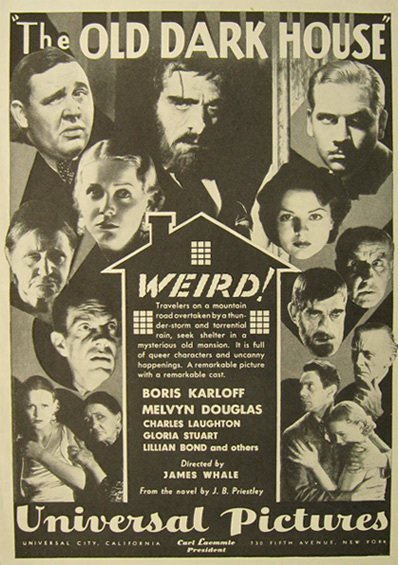 Released October 20, 1932 this was the first remake of a silent horror/comedy directed by James Whale. The cast alone makes the film worthwhile to see. It includes Boris Karloff, Charles Laughton (pre-The Hunchback of Notre Dame), Melvyn Douglas (pre-The Vampire Bat), Ernest Thesiger (pre-Bride of Frankenstein), Raymond Massey (pre-Things to Come) and as the heroine Gloria Stuart (pre-The Invisible Man and James Cameron Titantic). Of course there was the make-up work of Jack P. Pierce. The film would have two remakes. The first in 1941 with Charles Boyer and Margaret Sullivan and then a second time in 1961 with Susan Hayward and John Gavin. Some sources say the film was released on December 22, 1932 and others in January 1933. Basically this was a reworking of 1931's "Dracula". Although the screenplay for "Dracula" was by Garrett Fort and this film John L. Balderston. Carl Laemmale, Jr. liked the basic storyline of the previous film. In "Dracula" David Manners played John Harker and in this film took the similar part as Frank Whemple. 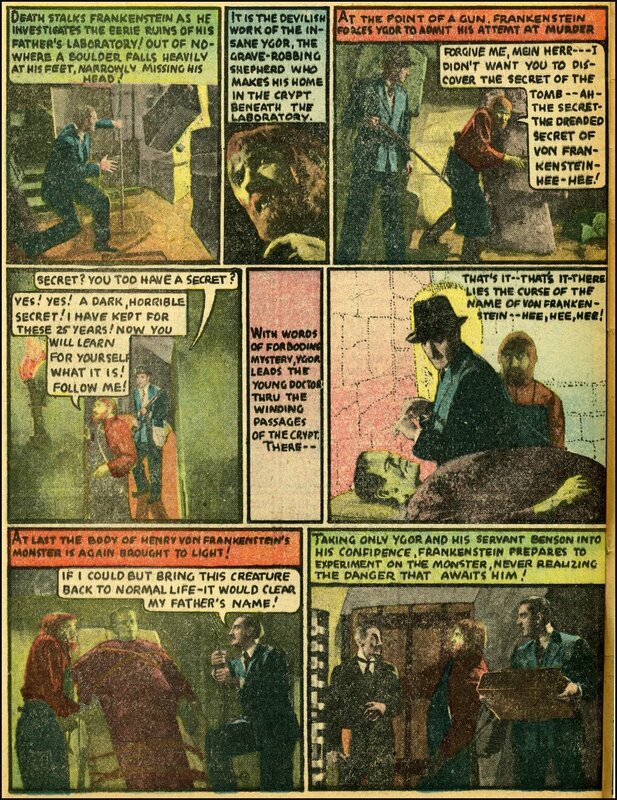 In "Dracula" Edward Van Sloan had the part of Dr. Van Helsing and in this film the similar part of Dr.Mueller. Instead of Bela Lugosi as "Dracula" we now have "KARLOFF" as "The Mummy". Jack Pierce did the make-up for four motion pictures in 1933 which included a circus picture with Animal Trainer and Adventurer Clyde Beatty, a film about a doctor killing his best friend and being tried and a comedy. The fourth film you would have thought Pierce would have been deeply involved in classic make-ups, but it was only the reappearance of Dr. Jack Griffith at the end of "The Invisible Man" does his expertise really come into play in conjunction with the Special Effects work of John P. Fulton, John J. Mescall and Frank D. Williams. Very loosely based upon the story by Edgar Allan Poe was "The Black Cat". This is a very creepy film and for once Lugosi is the hero. Here is the link to the complete motion picture of "The Black Cat". Enjoy some interesting make-up work by Pierce. Along with a duel of wills between Lugosi and Karloff. Six films later still in 1934 found Jack P. Pierce doing the make up for another motion picture based upon a Fannie Hurst "women's" novel "Imitation of Life". This film starred Claudette Colbert and Warren Wilson and deals with a secret about the "Women's White Daughter". Who is in reality the mixed race daughter of her black maid. A strong performance by actress Louise Beavers as Delliah the girl's real mother. The films deals with the young girl attempting to be white and eventually coming to terms with her Afro-American heritage at the end. Strong material for the year. The film would be remade in 1959 with Lana Turner in the Colbert role and Sandra Dee as the mixed race daughter. Here are two scenes from the 1934 motion picture. The year ended with Universal's version of Charles Dickens' "Great Expectation" made with many an American cast. A film that allowed a variety of make-ups from the uncredited Pierce. This film was followed by three classic horror make-ups in three classic Universal films. The first released on April 22, 1935 needs no explanation. This was James Whale's sequel to "Frankenstein" the far superior "The Bride of Frankenstein" with Colin Clive reprising his role of Henry Frankenstein and Boris Karloff in an even better make-up from the "Artist" that Janus Piccoula had become. One has to wonder at this stage of his life as Jack P. Pierce what his parents thought about their son. Pierce created the new Karloff make-up to reflect the fire in the mill at the end of the first film. Careful viewers will note that over the length of the film the make-up has subtle changes reflecting the healing of the damage caused by that fire. Both James Whale and Jack Pierce worked on the design for Elsa Lanchester as "The Bride", but it was Pierce who came up with the iconic hairstyle. Some other make-ups including Elsa Lanchester as Mary Shelley for the film's opening. The very first known werewolf film was created in 1913 and revolves around the tale of an American Indian woman who transforms into a wolf to seek revenge for the death of her lover. Although the knowledge of this exists the film itself has long since disappeared. The make-up originally designed for actor Henry Hull was to have been the exact same one Jack P. Pierce would created in 1941 for Lon Chaney, Jr. However, two factors intervened: the first is the studio wanted a similar make-up and the second was that Hull refused to sit the length of time required to apply the make-up. This is a great movie and I will let the Website: "monsterbashnews" explain it to my reader as I am interested here in the make-up. There is a first Werewolf seen in the film that bites Henry Hull, but to day nobody is sure who it really was played by. It is suppose to be co-star Warner Oland, but as the above article mentions nobody really thinks he played it. Warner Oland below in the film with Henry Hull. This motion picture had sequences so strong that it led to a temporary ban in England on horror movies from any country. Below Karloff after Lugosi's made surgeon has altered him. Pierce would work his magic on nine more films into 1936 that would include the first version of "The Magnificent Obsession" with Irene Dunne and a very young Robert Taylor, "The Invisible Ray" more a standard melodrama than horror story with both "Karloff" and Bela Lugosi, "Sutter's Gold" a fictonized story behind the 1849 California Gold Rush. Also the film the lost so much money it was the straw that cost Carl Laemmale and his son control of Universal Pictures which he had founded. The budget was $2 million dollars when a normal Universal release at the time averaged $100 thousand dollars. The ninth film earned Jack P. Pierce the uncredited title of "Special Effects Artist" on the motion picture "Dracula's Daughter". What that title meant I have no idea. It would return for some other films later, or a variation of it. We now come to a very interesting James Whale directed motion picture release May 17, 1936that relayed heavily on Pierce's ability to make the stars age convincingly on screen. It was the first sound adaptation of Jerome Kern's and Oscar Hammerstein II's musical based upon Edna Ferber's novel "Show Boat". This is my favorite film versions and part of the reason is that Hammerstein wrote the screenplay himself. The film also had some great legitimate stage and screen recording stars in it of the day. 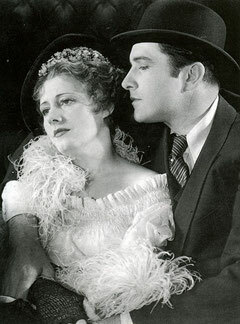 Playing the leads were Irene Dunne and Allan Jones. The part of Joe and singing "Ol' Man River" was the great Paul Robeson and his equal and perhaps greater Helen Morgan was cast as Julie singing the ballad "Bill". I know I detour here, but for those two songs alone you must see this black and white feature film beautifully filmed by James Whale. Here are some scenes with Pierce's make-ups. Moving to May 2, 1937 found another film more of a mystery than horror, but actually classified as a Science Fiction Crime Story. The attached link from the Website "Classic Film Freak" gives not only my reader an excellent overview of the film and Universal Pictures motivation for it, but also some excellent examples of Jack Pierce's make-up on "KARLOFF". Although the above poster say Boris Karloff this was the last film he was billed simply by his last name. Two films later on June 1, 1937 another film from director James Whale was released entitled "The Road Back". The story is interesting as it deals with a group of German World War One Soldiers attempted to adjust to civilian life and gave Pierce a chance to deal with a war scenario for some of the scenes. This is also a film that should have been a major anti-Nazi movie even in its day as it was based upon a novel by Erich Maria Remarque who had written "All Quiet on the Western Front". The rights to the novel had been obtained by the Laemmale's and they planned to pull no punches as did James Whale. However, as I said they were ousted from studio control and the new powers to be feared the threats from the Nazi's and Germany in general and all references to their party were removed from the script. This motion picture was followed by eight more routine make-up jobs for Jack P. Pierce until a film that would be released on January 13, 1939. That Universal Picture brought back an old and familiar face. Actually two a Monster and an actor named Boris Karloff. Along with Basil Rathbone, Bela Lugosi in a role that some people consider better than his own beloved "Dracula" and Lionel Atwill as a one armed Police Inspector in "The Son of Frankenstein". According to some sources both Boris Karloff and Bela Lugosi found themselves either not working, or in lower budget films. Such as 20th Century Fox's "Charlie Chan at the Opera" for Karloff and "Postal Inspector", I could not locate a distribution company name, for Lugosi's. Universal had been impacted over the embargo on Horror movies from the U.K. started in 1936 and it appeared until something major happens the new Executives decided to not make them. "According to Legend" in 1938 a Movie Theater in Los Angeles facing bankruptcy tried a ploy to get audiences and it worked. The played a "Triple Bill" of the 1931 "Dracula", the 1931 "Frankenstein" and the 1933 "King Kong". I bill I admit I would love to see today on the big screen. The result was Universal's new powers to be decided to make a big budgeted horror film again and "The Son of Frankenstein" was the result. According to the 1998 documentary "Universal Horror" the movie was to have been shot in color, but the look of Pierce's make-up in this medium just didn't work. Above the creator of the monster getting a taste of his own medicine. Boris Karloff and Jack Pierce on the set of "The Son of Frankenstein". Besides the iconic Frankenstein monster Jack Pierce created another great character make-up for Bela Lugosi. The broken neck from a hanging he didn't die from Ygor. Pierce's make-up for Basil Rathbone and Lionel Atwil had his little touches. 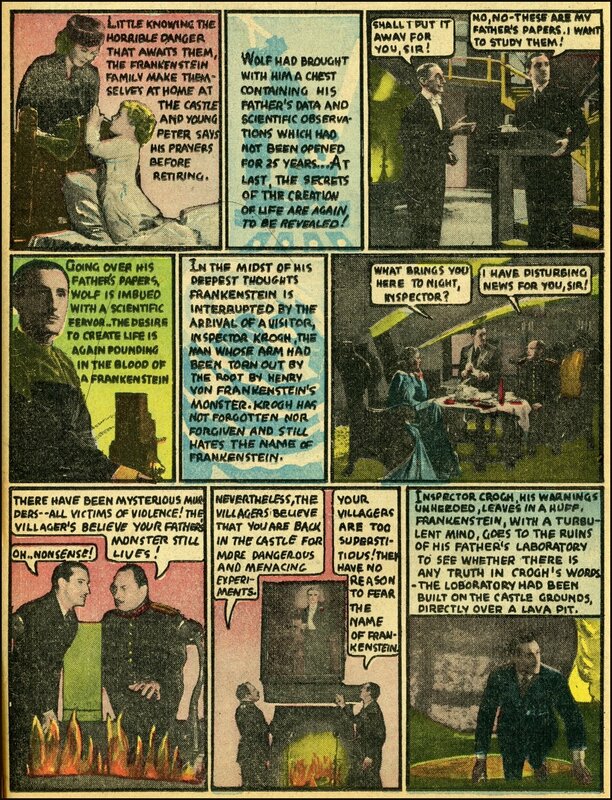 The following is from a comic book that came out "Movie Comics #1" from April 1939. These pictures comes from "The Golden Age Site" also on "Blogger". Note that the images are stills from the actual movie and so reflect on Jack P. Pierce's work by being shown in a medium kind of like Rotoscoping. November 13, 1939 saw the release of "The Tower of London" with Basil Rathbone playing Richard the Third. This is not Shakespeare's play, but a semi-historically accurate recreation of the events around Richard's rise to power. An added character to take care of things for Richard was a club-footed henchman played by Boris Karloff of course. The movie also had Vincent Price in his fourth motion picture role as the Duke of Clarence. Six days earlier the Errol Flynn, Betty Davis film "The Private Lives of Elizabeth and Essex" had been released with Price playing Sir Walter Raleigh. Price would play Richard in Roger Corman's low budget film also called "The Tower of London", but Price always stated Rathbone's portrayal was better than his own and that of Sir Lawrence Oliver. Here are some of the images reflecting Pierce's work. After "Dracula's Daughter" he was back to being called simply a "Make-up Artist" and uncredited as usual. Two more films including "Black Friday" with Karloff and Lugosi once more and an a solid script by Curt Siodmak and then the first of the series of Mummy films about Kharis, but without Lon Chaney, Jr.
"The Mummy's Hand" was released on September 20, 1940 and playing the role of Kharis was Western "B" Actor Tom Tyler who played Luke Plummer in John Ford's "Stagecoach" and would become Republic Pictures "Captain Marvel" in a 15 Chapter serial. Unlike Lon Chaney, Jr's. more famous Kharis. The make-up on Tom Tyler is just plain diabolical and scary. It is to bad the story was made to be pure horror and not have several comical breaks in it. 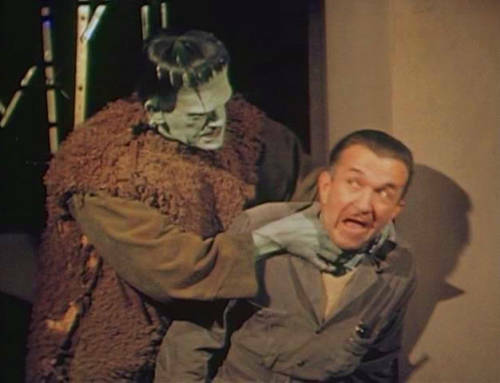 March 24, 1941 saw Jack Pierce do what make-up was required to turn Lon Chaney, Jr. into "The Man Made Monster", This film is a low budget picture about a man who becomes charged with electricity by a mad scientist, Lionel Atwill, and a controlled killer. Almost the exact story was filmed with an even lower budget by Allied Artists in 1956 as "The Indestructible Man". Once more with Chaney, but instead of Lionel Atwill the mad scientist was Robert Shayne. "Man Made Monster" was an example of the types of roles Chaney, Jr. was being given even since he started acting to play off his father's name. Even after his marvelous performance as Lenny in 1939's "Of Mice and Men" opposite Burgess Meredith and the under appreciated role of Akhoba in Hal Roach's "One Million B.C." released on April 5, 1940. However, this would all change at the end of the 1941 when "The Wolfman" was released on December 12, 1941. The first of the films about Lawrence "Larry" Talbot gave Jack P.Pierce his first chance to use the make-up he designed for Henry Hull back in 1935 and gave Lon Chaney, Jr. an immortal horror role to equal Karloff and Lugosi. "The Wolfman" was the first picture that Jack P. Pierce received on screen credit for his make-up work. Unfortunately, there still would be many more uncredited motion pictures, but not for the next five motion pictures. Four of which are classics in their own way. The next motion picture is notable for two things unrelated to Pierce directly. Released on March 13, 1942 it was "The Ghost of Frankenstein" and the first Frankenstein film without Boris Karloff and the true start of a series of lower budgets movies featuring the monster. It also featured Bela Lugosi once again playing Ygor. Playing the creature Henry Frankenstein created was Lon Chaney, Jr. as Boris Karloff flatly refused to done the make-up one more. Before I go any farther the following link is to a segment from the popular 1950's show "This Is Your Life". One of the 1957 programs was about Boris Karloff and this is the portion where Karloff and Pierce meet again after many years. The most notable effect to the classic make-up of the monster is seeing Lon Chaney, Jr.'s features showing through. Lon did Karloff well in the part and would add a touch to the monster that remained ever associated with it. At the end of "The Son of Frankenstein" the monster is pushed into a sulfur pit. In this film it is now blind which it would remain through all the following motion pictures. Chaney to give that idea to the viewing audience kept his arms out in front of him as if the monster had to constantly touch his surrounding to get around. Resulting in both a distinctive look and walk. Jack Pierce had to create two make-up looks for Lon Chaney, Jr. The first what he looks like after being discovered once more by Bela Lugosi's Ygor covered in sulfur and one without the substance. October 23, 1942 saw Lon Chaney, Jr. once again playing somebody else's monster. This time Tom Tyler's "Mummy" in "The Mummy's Tomb". 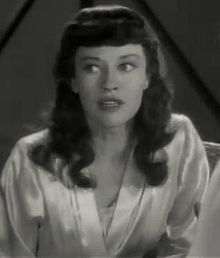 However, Kharis would always become his in this film and its two 1944 follow ups "The Mummy's Ghost" and "The Mummy's Curse". Jack P. Pierce's credit for the make-up Chaney wore is interesting and a bit confusing. In "The Mummy's Tomb" he received on screen credit for "Special make-up". For "The Mummy's Tomb" he received on screen similar credit as the "Special Make-up Artist", but in the last "The Mummy's Curse" he received no on screen credit at all. Go figure Universal Pictures out. The final film of the series has an interesting make-up transformation, but not for Chaney. It is for Virginia Christine who plays the reincarnated Princess Ananka. At the end she transforms from a beautiful women into a long dead mummy. Once more Lon Chaney, Jr. would be teamed up with Bela Lugosi. Chaney would be playing Lawrence Talbot for the second time and Lugosi donned the Frankenstein monster make-up with two problems. The first was the monster looked like Bela Lugosi and the second he could not create his own interpretation as it was decided that Lon's walk would remain and Lugosi couldn't do more than emphasize it even stronger. The film was "Frankenstein Meets the Wolfman" and according to Curt Siodmak the screenplay writer. The motion picture was a result of a joke he made at the Universal Lunch Room to producer George Waggner. According to Siodmak he joked he could write a script called "Frankenstein Wolfs The Meat Man". John Carradine was the insane scientist and "Acquanetta" played the titled character. Who this actress really was remains somewhat of a mystery and good publicity. Some reports claim she was really Mildred Davenport from Norristown, Pennsylvania. She claimed being born Burnu Acquanetta, meaning “Burning Fire/Deep Water”,in Ozone, Wyoming. Orphaned from her Arapaho parents when she was two. Basically you could substitute her character for Lawrence Talbot as instead of a man becoming a Werewolf. We have a women becoming an Ape Women thanks to Jack Pierce's make-up work. This movie was part of a trilogy with Acquanetta "Captive Wild Women" 19843, "Jungle Women" 1944 and "Jungle Captive" 1945 all about Paula the Ape Woman. Here are some shots of her with Pierce's make-ups. Lon Chaney, Jr. wanted the title role of the next film, but was turned down. In my mind what a publicity opportunity it would have been, because of the name of the original film actor. The role was actually intended for actor Broderick Crawford, but went to Claude Rains. On August 23, 1943 Universal Picture released in Technicolor "The Phantom of the Opera". You don't get to see Jack Pierce's make-up for the scared Claudine until the final frames of the motion picture, but it is very effected based upon the idea that a women tossed acid on it. There were other period make-ups that Pierce would work on including those for singer/actor Nelson Eddy and new comer Susanna Foster. Both of whom had billing over Claude Rains. Along with some spectacular opera sequences to show off Eddy's voice. The film at time seems to be missing elements. Some of the dialogue implies that Raines might actually be the father Foster never knew and that is the motive for his concern for her career. I have a DVD copy of the film which in an extra mentions that a key scene between Nelson Eddy and Claude Rains before he becomes the Phantom was edited out. That scene's dialogue would have made it clear that Raines is Foster's father. The motion picture had a planned sequel which would explain the somewhat ambiguous ending that leaves the audience wondering, if the Phantom did not die as if you listen carefully there is the sound of moving rock. The motion picture was to have been called appropriately "The Climax", but there was problems obtaining Claude Rains and the sequel was dropped from production. Jack P. Pierce received screen credit in both films as "Make Up Artist". Between 1943's "The Phantom of the Opera" and 1944's "The Climax" Jack P. Pierce worked on ten other feature films. Among them the aforementioned "Jungle Women" and "The Mummy's Ghost". There were two adventure films with John Hall "Ali Baba and the Forty-Thieves" January 14, 1944 and "The Cobra Women" May 12, 1944. In this mix were also two interesting horror films both giving Pierce screen credit as "Special Effects Make-up Artist". The first was released November 5, 1943 with Lon Chaney, Jr. following both Bela Lugosi and Gloria Holden as "The Son of Dracula". Except his name is Count Alucard, or Dracula spelled backwards. The make-up work was routine and one wonders why it was considered "Special Effects Make-up" over his other horror work. November 12, 1943 saw the release of "The Mad Ghoul" aka: "Mystery of the Ghoul" which is classified as a Science Fiction/Horror story. Playing the title character is David Bruce an actor most people would not know, but who appeared in the Errol Flynn film "The Sea Hawk", Pat O'Brien's "Knute Rockne All American", Edward G. Robinson's "The Sea Wolf", Gary Cooper's "Sergeant York" and John Wayne's "Flying Tigers" among other films before and after this one. Heavy George Zucco turns him into the Ghoul and the young lovers of the piece are played by Turhan Bey and Evelyn Ankers, Here are some of make-ups from the film by "Special Make-Up Artist" Jack Pierce. Another break in this period from horror films found Pierce doing the uncredited make-up for the motion picture "The Scarlet Claw" released May 26, 1944. The film was the Sixth in the Universal Series of Sherlock Holmes films featuring Basil Rathbone and Nigel Bruce. He would be the "Make-Up Director" on the Tenth Sherlock Holmes film "Pursuit to Algiers" released October 26, 1945. Then his screen title became "Director of Make-up" on the Eleventh Holmes entry "Terror By Night" released February 1, 1946 and in the same capacity on the final entry "Dressed to Kill". Why Jack Pierce never got screen credit for "The Scarlet Claw" when he was for other motion pictures at this time remains a mystery for Holmes and Watson to solve. Cowboy actor Glenn Strange's face is known to a lot of fans of Westerns both in the movies and on television. His Western movie career started in 1930 in "The Mounted Stranger" and includes 1957's "Gunfight at the OK Corral" and 1959's "Last Train from Gun Hill". His 314 movie and screen appearances would also include a role in Elvis Presley's "Jailhouse Rock" and the bartender "Sam" on television's "Gunsmoke". Along with TV appearances on such diverse programs as "The Life and Legend of Wyatt Earp", "The Untouchables" and "Petticoat Junction". However, this Cowboy has another distinction. He is the only actor besides Boris Karloff to play the Frankenstein monster in three consecutive motion pictures starting on December 1, 1944 in "House of Frankenstein" the first two with make-up by Jack Pierce. The last of the three was the 1949 Monster Comedy "Abbott and Costello Meets Frankenstein", but Jack P. Pierce was no longer the make-up at Universal Studios having been let go in 1947 as "too old fashion" with his make-up designs that also took "too long" to apply. Bud Westmore recreated his classic looks. 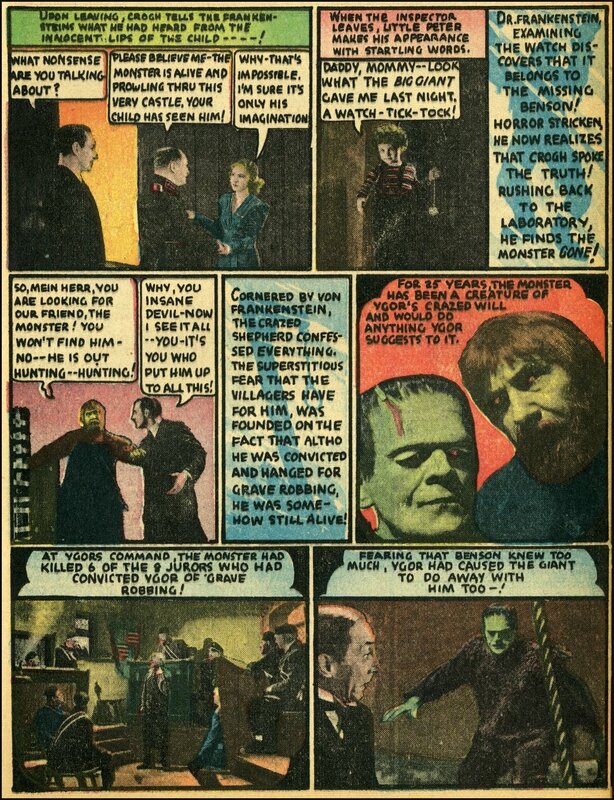 Strangely more people recognize Glenn Strange's Frankenstein than Boris Karloff's. Before she was the mother on "Lassie" June Lockhart was "The She Wolf of London". Before Don Porter was Salley Fields dad on the television series "Gidget" he was the boyfriend of "The She Wolf of London". Only problem was there was no real She Wolf of London in this mystery about a young women who thinks she turns into a werewolf. Can you say a variant of Val Lewton's classic 1942 motion picture "Cat People" without the transformation and with an even lower budget. 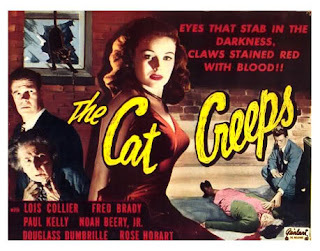 The film was release May 14, 1946 and three days later "The Cat Creeps" was also released. That mystery was about a black cat that was suppose to be possessed by the spirit of an elderly murdered women. The difference with these two motion pictures was Jack P. Pierce was not listed as Make-up Artist, but "Director of Make-Up". The proceeding year Universal Pictures merged with International Pictures to form Universal-International and this led to a major shake up of ideas and direction for the new merged company to take. The studio moves that would led to his break from Universal Pictures had started and Pierce found himself overseeing other Make-Up Artists on films rather than just being the artist. He was in a created "management" position to rein him in. The new Universal-International Pictures was transitioning from Horror films to mainstream film production. American's were not into monsters after experiencing the "horrors" of World War 2. To the new heads Jack P. Pierce seemed outdated. Of the next Twenty feature films Jack P. Pierce's name was listed for screen credit. Only TWO had him as "Make-Up Artist" and the other Eighteen gave him screen credit in his new role as "Director of Make-up". Jack P. Pierce was not always a hands on make-up artist anymore. Some of the titles within that group of Eighteen Motion Pictures included Burt Lancaster and Ava Gardner in the classic film "The Killers", the period piece "Magnificent Doll" starring Ginger Rodgers as Dolly Madison, Susan Hayward in "Smash -Up: The Story of a Women". Another Susan Hayward vehicle was Western "Canyon Passage" co-starring Dana Andrews and Brian Donlevy. Dan Duryea and and Peter Lorre starred in the film noir "Black Angel". Most of the other films went toward lighter fare like the Revolutionary ghost story starring Bud Abbott and Lou Costello "The Time of Their Lives" and "B" Westerns starring such actors as Kirby Grant who would become television's "Sky King". The two films Jack Pierce actually did the make-up for work were also comedies. One stared Joan Davis "She Wrote the Book" released May 31, 1946 and the other was a comedy mystery "The Runaround" released June 4, 1946, Neither film requiring major make-up work as in his past. Some other reasons that were given as contributing to this "Promotion" by the new Executives of the merged studio, Started with a review of complaints over the years from Lon Chaney, Jr., Boris Karloff and others about Pierce being a taskmaster and very demanding on the actors he worked upon. 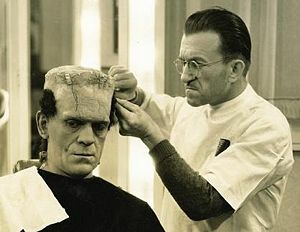 In the case of Chaney he had an allergic reaction to the make-up Jack Pierce used for "The Ghost of Frankenstein". He was very vocal about the amount of time, up to Eight hours, spent by Pierce applying the bandages for the Mummy. So Lon Chaney, Jr. took his frustrations out on Pierce directly by complaining to the ever changing powers that be. It should be noted that Lon Chaney, Jr. did a lot of complaining about people he worked with. Another story states Boris Karloff had the marks of the 1931 Frankenstein Bolts on his neck till the day he died. True or not Jack P. Pierce was a perfectionist and demanding artist, but the times were changing for make-up techniques and he was also old school. An example of "old school" vs "new school". On the right Jack P. Pierce's make-up for Lon Chaney, Jr. in the 1941 "The Wolfman", On the left the Wolfman make-up by Bud Westmore for 1949's "Abbott and Costello Meet Frankenstein". Look closely at the picture of Glenn Strange and Lon Chaney, Jr below. You can see the gloss of the applied appliances to Chaney. A technique the "new school" artists used to cut time applying the make-up and discomfort to the actor as compared to what Jack Pierce had to do over the years. Jack Pierce's first job as after leaving Universal Studios and his only work for 1948 was on the Ingrid Bergman motion picture "Joan of Arc" for RKO released November 11, 1948 in a world premier in New York City. He was one of two make-up artists on the production along with two hair stylists and a personal "barber" for Bergman, Here are some scenes from the film, but of course we can not know whom he worked upon. In 1949 Jack Pierce became one of two make-artists on three Independent films. "The Big Cat", "Reign of Terror" and "The Pilgrimage Play".the first two distributed by Eagle-Lion Films and the third by Preferred Pictures Corporation. On November 24, 1950 Jack P. Pierce did his first television program. He was the sole make-up artist on Episode 6 of the First Season of "The Magnavox Theater" in their 60 minute presentation of Alexander Dumas' "The Three Musketeers" starring actor Robert Clarke. From a television perspective this was the first hour long drama ever presented. Of course the sponsor was Magnavox television sets. Christine Manning returns to her father's home in Texas for the summer. She soon realizes that her father, oil millionaire Les Manning, is disliked and feared as a ruthless businessman by the people around him. Les Manning has always relied on himself to become successful and has never trusted in God. But he may have to change his ways. This all led to more television work. Jack Pierce was now working to stay in his profession. When I was growing up there was a television series that dramatized real life events entitled "You Are There". During the period of 1953 to 1955 Pierce worked on Five Episodes of the show. This would be followed by the television series "Screen Directors Playhouse" from 1955 into 1956 with him doing Twenty-two of their programs. From 1956 into 1957 he worked on Eleven Episodes of a program I don't remember called "Television Time" which featured plays by the host John Nesbit who seemed to control it. As it wouldn't be until late 1957 that he started permitted other writers for the series. 1958 saw Jack Pierce work on four films three of which might have come from his Universal Pictures days. Originally to be called "Meteor Monster" the title was changed to "Teenage Monster", because of all the films like "I Was A Teenage Frankenstein" and "Teenage Caveman" that was craze at the time. Here are a few stills of Jack Pierce's work. Also he doesn't look like any teenager I knew at the time. Next up released on January 26, 1958 was a Western starring Rex Reason and Nancy Gates "The Rawhide Trail". In March Jack Pierce did some fine make-up work on Wrestler Buddy Baer who used to Box at the Ocean Park Arena in Southern California when my family owned it, Along with his brother Max. Baer plays Vargas the Giant in "The Giant from the Unknown" about a dead conquistador who comes back to life after a lightening strike. He then proceeds to terrorize a small mountain community populated with some great "B" actors like Bob Steele, Ed Kremmer, Morris Ankrum and Sally Fraser. July of 1958 saw Richard Boone is a very well written little film with make-up by Jack Piece called "I Bury the Living". The moral of the tale is not to place the markers for a living person on their grave site, before they are actually dead or they may die to keep the map correct. Here is the link to this great little film. Jack Pierce now turned his talents to television once more. His first work aired on October 22, 1959 on a program entitled “No Funeral for Thorn”. This was the third program of the Second Season of Gene Barry’s hit show “Bat Masterson”, but it was only one job. His next work was also a one shot episode entitled “A Flash in the Sky” that aired on April 6, 1960 on William Lundigan’s TV show “Men Into Space”. These were followed by the last five feature films he would ever work upon. Three Science Fiction’s consisting of very low budget productions starting with “The Amazing Transparent Man”. The movie was about a scientist who wants to make an invisible army to take over the world and was released in July 1960. Pierce was reunited with Robert Clarke in Clarke’s production of “Beyond the Time Barrier” also released in July. The film was shot in Texas over 10 days and was a typical Cold War Era story, but strangely I always liked it. It was about a Test Pilot who crashes into the future and discovers the world has been wiped out by an unknown plague. When he finally returns to the present the twist is he is the plague carrier. This was routine make-up work for Pierce until we see Clarke at the film’s conclusion. On September 13, 1961 Jack Pierce did “The Devil’s Hand” about a satanic cult. The cast included some old Hollywood standbys such as Robert Alda. Who in eleven years would be known more as his son Alan’s father than for the excellent movie roles he did. Neil Hamilton who would find his career rejuvenated in five years as Commissioner Gordon on the Adam West/Bruce Ward TV show “Batman” and portraying an Elderly Cultist was Gertrude Astor. She had been the heroine of the original 1927 “The Cat and the Canary” and was in Charlie Chaplain’s classic “Monsieur Verdoux”. Along with both “Sunset Boulevard” and “All About Eve” among other films. Like Pierce you find work where you can when you want to stay in the business and in some cases eat. On July 3, 1962 Jack P. Pierce did the make-up for a cleverly disguised film on racial issues and tolerance. As eleven years earlier Robert Wise had used Science Fiction as a vehicle about the Second Coming of Jesus. Set during 1951 Cold War America the Jesus character here called Klaatu walks among average American’s who do not recognize him for what he is and turn against him out of made up fears. Many viewers today still don’t realize the underlining significance of “The Day the Earth Stood Still”. In Jack Pierce’s last film work it was Jay Simms as writer and Wesley Barry as director doing the same with American race relations in “The Creation of the Humanoids”. It is an interesting but overly talky motion picture. However, it is worth seeing if for no other reason than to see how a sensitive issue of the time needed to be handled on screen to get their message across. For the Christmas Season released on December 6, 1962 Jack Pierce did the make-up for a family fantasy film version of “Beauty and the Beast”. It starred Mark Damon who starred with Vincent Prince in Roger Corman’s “House of Usher” and Joyce Taylor who starred in George Pal’s “Atlantis the Lost Continent” and was also in “Flash in the Sky” from “Men Into Space”. When it seemed that Jack Pierce would be forgotten television came through when Walter R. Brooks and FIlmways hired him as make-up artist for a little program they called “Mr. Ed”. Of the 143 episodes of the show Jack Pierce would do the make-up for the first 104. On July 19, 1968 Jack P. Pierce passed away in almost total obscurity. He is buried at Forest Lawn Memorial Park in Glendale, California. Eleven years prior to his death Screen Gems, a subsidiary of Columbia Pictures, made an arrangement with Universal-International to release 52 of their classic monster films into syndication. In October of 1957 the early work of Jack P. Pierce was discovered by my generation on “Shock Theater”. Yet, as we enjoyed these films hiding under our bed covers we still did not know who had made them. Remember almost all of those classic films gave him no screen credit. Today we know his name and his legacy has been passed on to others. RIP creator of Frankenstein, the Mummy, the Werewolf and The Brain from Planet Arous.